IT was no fault of the participants that this concert proved to be one of the least satisfactory of the festival so far. 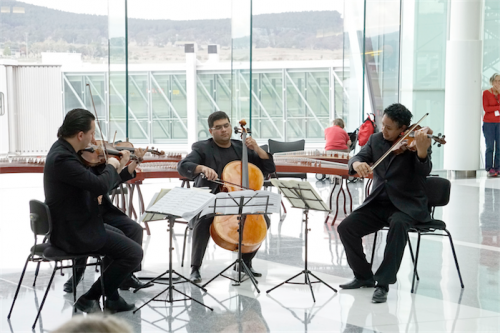 The Canberra Airport Atrium, despite its soaring spaces, proved an inhospitable space to listen to fine music. The busy atrium of an operating airport had all the charm of a shopping centre, and similar distractions. On arrival, elderly patrons were upset by the requirement to remove their shoes to get through security, constant loudspeaker announcements continually broke concentration, travellers hurrying through the performance area to get to their flights distracted, while airport staff made little effort to work quietly, loudly chatting among themselves, appearing to resent the concert as an interruption to their routine. Despite the atmosphere, the musicians did their best to create magic. Bassoonist, Ben Hoadley opened the program with a fine performance of Gilliam Whitehead’s suite for bassoon, “Nga Ha O Nehera”. Despite the excellence of the playing, this complex and rather mournful composition seemed a curious choice to open a showcase especially in this environment. Seven members of the Singaporean ensemble, Ding Yi Music Company, lifted the atmosphere, firstly with a lovely arrangement of the traditional song “Swallow”, familiar from Shu-Cheen Yu’s astonishing vocal version in Monday’s High Court concert, then, surprisingly, a swinging “Singapore Medley” that set toes a-tapping, performed on a fascinating collection of exotic traditional instruments. The Song Company wisely encouraged their audience to gather around them as they stood in a circle to perform some stunning vocal pyrotechnics, delighting with a lovely arrangement of “Sakura, Sakura”, followed by compositions by Arvo Part, William Cornysh, Adrian Self and Antony Pitts. The Simon Bolivar String Quartet from Venezuela, dazzled with their stirring rendition of the Castellanos “Fantasy for String Quartet”, following which they demonstrated their exceptional brilliant warm tonal balance and thrilling dynamics with equally virtuosic renditions of works by Haydn, Bitran and Beethoven. 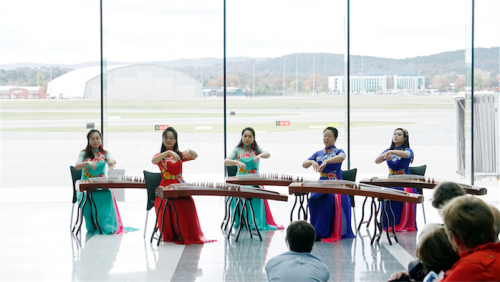 In complete contrast, the spectacularly costumed China Orient Orchestra completed the program with a selection of traditional Chinese music elegantly performed on traditional zithers, succinctly demonstrating, for anyone who saw their Monday performance in the High Court, how much their performance, as well as those of the other participants, was compromised when presented under these conditions. Thankfully, all these ensembles can be heard during the festival in more appropriate surroundings. As it was, the best that can be said for this concert was that it provided a different musical experience. What complete nonsense! I attended the concert and thought the setting was inspirational. 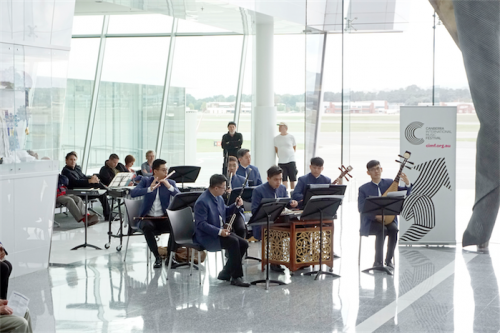 With the vibrancy of the airport, its beautiful design and outlook, , the planes coming and going, it provided a venue for living music. The audience and the musicians seemed to love the experience. Passengers passing by had their cameras out. Nothing not to enjoy about this concert!